As I noticed that this week is Negroni week – quite possibly my favourite cocktail – I thought it would be a good time to write a little but about our Old Raj Gin. 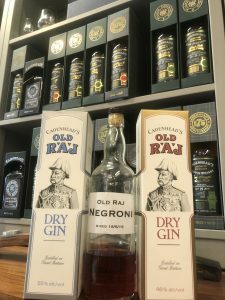 At Cadenhead’s we are best known for our Whisky and our Rum, however we have been offering our Old Raj Gin since 1972. As I often say, we have been bottling Gin since way before Gin was cool and we will continue to bottle it long after it stops being fashionable – not that we see that happening for a long time. Unlike many new Gins we do not pretend that we distill our own Gin, we are an Independent bottler so it makes sense that we also are an Independent bottler of Gin. The Gin is made for us to our recipe and then shipped to Campbeltown where we reduce the ABV and then add saffron prior to bottling. Our Old Raj is in our opinion a more traditional style of Gin being very much juniper lead, unlike many gins that are being released today that are verging much more on flavoured vodka rather than Gin – however that is probably an argument for another day! And Post distillation Saffron is added. We then bottle at two different strengths – 46% and 55% ABV. Even though both gins are exactly the same apart from the the addition of 9% more water in the 46% version they do taste different. The 46% is more expressive on the nose and slightly more refreshing on the palate where as the 55% has a slightly more closed nose but then is bigger on the taste, without having any form of alcohol burn, but adds a bigger mouth feel as it is much creamier and also has a more pronounced saffron element. Although Old Raj is particularly good in a Gin and Tonic simply with a slice of lime – no fancy garnishes for us – it is a gin that stands up very well in a cocktail. Personally I favour the classics, such as a very dry Martini but more often than not I opt for a Negroni. Hence why I have a 5 litre Vat of Negroni in my house at all times! The Negroni is one of the simplest cocktails around (yet another reason why I love it!). 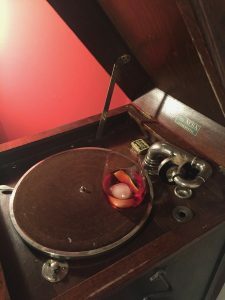 No obscure ingredients or complicated methods – simply add equal measures of Old Raj Gin, Campari and Sweet Vermouth in to a mixing glass with ice, stir and then serve with ice and add a twist of orange. Job done! I guess another reason that I love the Negroni so much is that it is a bit like me! Not to everyone’s taste, full of alcohol and quite bitter! I have an (as yet) unopened bottle of the blue label in the cupboard – time to open it methinks!